Making something fly involves a lot of trade-offs. Bigger stuff can hold more fuel or batteries, but too big and the lift required is too much. Small stuff takes less lift to fly but might not hold a battery with enough energy to do so. Insect-sized drones have had that problem in the past — but now this RoboFly is taking its first flaps into the air… all thanks to the power of lasers. We’ve seen bug-sized flying bots before, like the RoboBee, but as you can see it has wires attached to it that provide power. Batteries on board would weigh it down too much, so researchers have focused in the past on demonstrating that flight is possible in the first place at that scale. But what if you could provide power externally without wires? 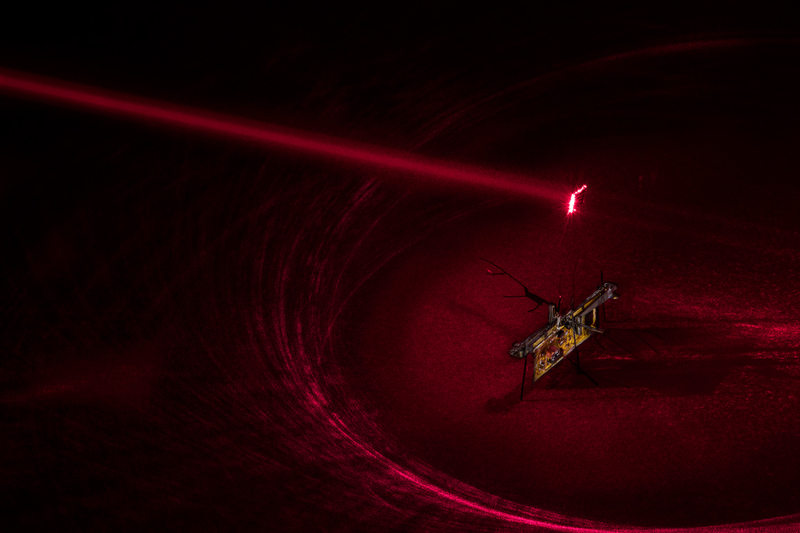 That’s the idea behind the University of Washington’s RoboFly, a sort of spiritual successor to the RoboBee that gets its power from a laser trained on an attached photovoltaic cell. “It was the most efficient way to quickly transmit a lot of power to RoboFly without adding much weight,” said co-author of the paper describing the bot, Shyam Gollakota. He’s obviously very concerned with power efficiency — last month he and his colleagues published a way of transmitting video with 99 percent less power than usual. “To make the wings flap forward swiftly, it sends a series of pulses in rapid succession and then slows the pulsing down as you get near the top of the wave. And then it does this in reverse to make the wings flap smoothly in the other direction,” explained lead author Johannes James. At present the bot just takes off, travels almost no distance and lands — but that’s just to prove the concept of a wirelessly powered robot insect (it isn’t obvious). The next steps are to improve onboard telemetry so it can control itself, and make a steered laser that can follow the little bug’s movements and continuously beam power in its direction. The team is headed to Australia next week to present the RoboFly at the International Conference on Robotics and Automation in Brisbane.